Sports were designed to provide relief in society to distract people from the stress of their everyday lives. Typically an individual picks a favorite team in the sports leagues that they enjoy based on the geographical location in relation to where they live. This has typically been on how people decide what team to root for. So if New York was the closest city to which ever suburb you lived in, you would like all the teams that fall under the New York City sports umbrella. This is the traditional way of how people claimed their sports fandom roots. But as technology advanced and access to watching sports leagues became more accessible this had changed and people began to jump on certain teams based on who was the best or which team had the best players. These are known as “bandwagon” fans who are looked down upon in the sports realm. But for the sake of 1919 loyalty to one’s city approach was almost how everyone claimed to a team one way or another. 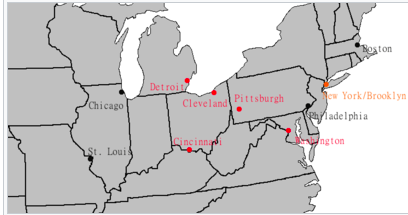 (Major Baseball Cities in the United States, 1919) 1. “History of Baseball in the United States.” Wikipedia, Wikimedia Foundation, 13 Feb. 2019. Nowadays in the United States there are so many sports leagues that people follow. But rewind 100 years ago baseball was really the only major sports league people followed as soccer never really caught on in the states and none of the other leagues we have today such as the NBA, NFL, or NHL were not founded yet. So the MLB was more or less the monopoly of the time. With no television yet citizens would tune in on their radios or go to the ballpark if they could afford to and watch their favorite team play. (Babe Ruth as a member of the Red Sox in his early days, 1918) 2.”Babe Ruth Timeline.” World History Project. Accessed February 20, 2019. Baseball was “the sport” at this time and everyone who enjoyed sports largely watched baseball. In this country’s history there is a reason why baseball is known as our “national pastime.” It was the best distraction from your life that you can get. Baseball has the richest history of any sport in America since it was created in the mid 1800’s. Which brings me to my next point. The term “rivalry”, used very commonly in sports, refers to a hatred between two teams. Whenever two rivals face-off the game for sure will be intense and there is typically a good reason as to why the two teams have bad blood for one another. It can be based on proximity to one another, a memorable moment in a big game, or a monumental event took place between the teams that altered the course of history. When you ask any sports fan or even most common fans “who are the biggest rivals in sports” there is a pretty universal answer. That answer is the New York Yankees and the Boston Red Sox. (Yankees and Red Sox logos) 3. Leger, Justin, Nick Goss, and NBC Sports Boston Staff. “Red Sox and Yankees Receive Undisclosed Fines for Watchgate.” NBC Sports Chicago. September 15, 2017. Accessed February 20, 2019. The mutual hatred for one another goes back over one hundred years with so many iconic moments. As well all know the Yankees are the most storied franchise in North American sports winning 27 championships since the early 1900’s when they were founded. They have one in almost every decade since the ’20s making them very easy to hate. There have been so many iconic moments in the thousands of times these teams have met and it seems every generation there are new iconic figures on both sides who always seem to grow to hate one another. But there is one point in history where you can point your finger at to signify where it all began. 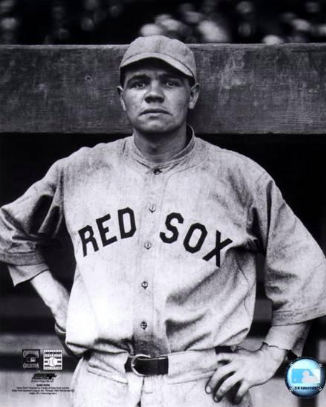 This was March 2019 when then owner of the Boston Red Sox at the time, Harry Frazee, sold George Herman Ruth, also known as “Babe Ruth”, to the New York Yankees ball-club for $125,000. 4. (Newspaper headline from New York World Newspaper, January 1920) 5. 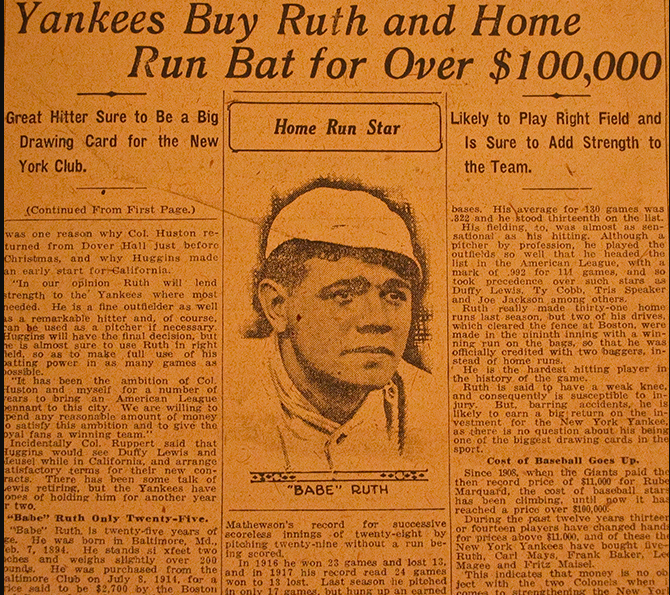 “YANKEES BUY BABE RUTH FROM THE BOSTON RED SOX!” The Mitchell Archives – Original Historic Newspapers. Accessed February 20, 2019. 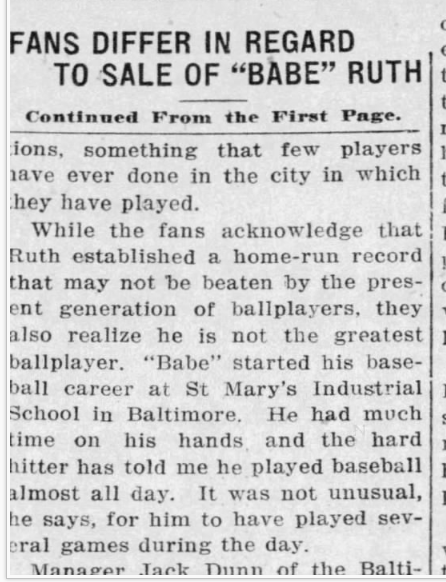 As mentioned before we know how great of a player Babe Ruth was at this time. This was undeniable. What was also was undeniable was the reaction of Boston sports fans at this time. 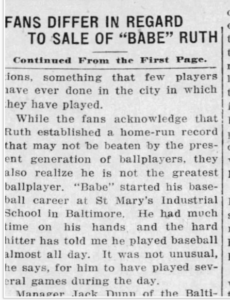 Within this clipping you can see fans claiming that there is no replacing Ruth’s offense in the lineup and losing him makes the Red Sox considerably worse. He accounted for 90% of the offense the previous season. While New York was already crowning themselves future pennant champions, Boston was in chaos. Boston’s owner David Frazee tried justifying the move by saying it was addition by subtraction because Ruth was so selfish and inconsiderate. But everyone sniffed out this move as one to make him money because shortly after he became way more involved with his Broadway career rather than baseball. As a result of this the Red Sox became a regular in second place while the Yankees franchise took off. 7. Babe Ruth began his career as an Oriole briefly, but was a member of the Red Sox for six seasons before his sale to the Yankees in 1919 despite leading the Sox to three World Series championships. But the magnitude of this trade would be felt for generations to come. Frazee made this deal because he knew he could not meet Ruth’s pay increase demands and needed money for his Broadway company interests it has been told. 5 Babe Ruth’s impact on the Yankees was felt instantly. He would slaughter home run records, offensive records, and brought in crowds that have never been seen before. He hit 50 plus home runs his first two years as a Yankees setting a MLB record each year. 8. He never hit less than 25 as a member of the Yankees. But his impact was not only felt on the field for the Yankees but also off the field. Babe Ruth became such a superstar and celebrity which was never seen in baseball before him. His popularity was so big it led to all-time attendance records and allowed the Yankees to move out of the Polo Grounds and build their own stadium which became Yankee Stadium. 9. (Aerial view of Yankee Stadium as it looked from 1928 to 1936,) 10. Yankee Stadium became known as, “The House that Ruth Built”, due to most of the revenue he brought in was used to fund the stadium being built. But what was truly remarkable about his time was the Yankees was the culture he built in the franchise. Before his arrival to the club the Yankees never won any sort of championship of any kind. While the Red Sox were the most successful team of the 20th century up to this point. But boy did the narratives change after this trade. He led the Yankees to seven American League Pennants and Four World Series titles. He was a part of possibly the best lineup ever created known as “Murderers Row” which was a collection of future hall of Famers such as Lou Gehrig, Earle Combs, Mark Koenig, Bob Meusel, Tony Lazzeri and Ruth himself who hit a new record 60 home runs. 11. 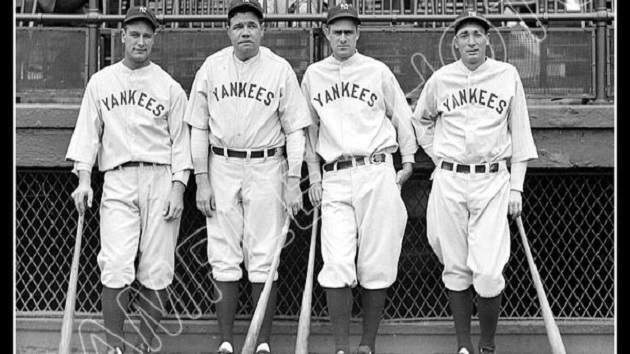 (Murderers Row, 1927 Yankees Home-Run Lineup) 12. Aronson, Harv. “Murderers’ Row Re-lived: Were the ’27 Yankees the Best? – TSP.” Prime Sports Net. April 28, 2018. Accessed February 20, 2019. When looking back at this deal it is known as “The Curse of the Bambino” for good reason. It is well-known as one of the worst trades of all time. Many consider Ruth to be the greatest baseball player of all time and certainly was the first recognizable star the sport ever saw. Ruth was a part of the inaugural 1936 Baseball Hall of Fame Class in Cooperstown, New York. He was a living legend when it was all said and done. But aside from the man’s legacy the magnitude of this trade was because of the directions these two teams went after this trade. This began the curse of the Red Sox franchise. The team did not win a World Series for 85 straight years following the 1919 trade of Babe Ruth. Which almost everyone points as the reason why they could never win. Meanwhile the Yankees would go on to win 39 pennants, and 26 World Series during the time-span more than double any other team during that stretch. This curse would hold true until 2004 when in the American League Championship Series the Boston Red Sox overcame a 3-0 deficit to the New York Yankees in a best of 7 series to beat them 4 straight and later win the World Series in just 4 games. By beating these same Yankees in the only 3-0 comeback in the sports history and then to win it all for the first time since this trade was made was certainly the curse breaker. 13. All in all, the magnitude of this trade was astronomical. It changed the course of baseball history. It launched the beginning of the most successful North American sports franchise. But at the same time it also led to 80 plus years of Boston sports fan suffering. When it is all said and done, the exchange of Babe Ruth was one of the most, if not the most, lopsided trades in sports history. 1. “History of Baseball in the United States.” Wikipedia, Wikimedia Foundation, 13 Feb.
2.”Babe Ruth Timeline.” World History Project. Accessed February 20, 2019. Undisclosed Fines for Watchgate.” NBC Sports Chicago. September 15, 2017. Accessed February 20, 2019. 4. 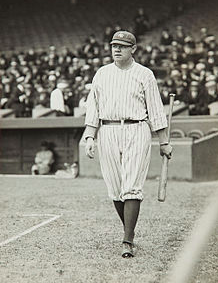 “New York Yankees Announce Purchase of Babe Ruth.” History.com. November 16, 2009. Original Historic Newspapers. Accessed February 20, 2019. Captain’s Blog. January 06, 2012. Accessed February 20, 2019. 9. “Biography.” Biography | Babe Ruth. Accessed February 20, 2019. 11. “Babe Ruth’s Full Baseball Statistics.” Babe Ruth Central. Accessed February 20, 2019. Net. April 28, 2018. Accessed February 20, 2019. 13. “New York Yankees 27 World Championships.” SI.com. Accessed February 20, 2019.